Eindhoven Airport is an airport located 4 NM(7.4 km; 4.6 mi) west of Eindhoven,Netherlands. In terms of the number of served passengers it is the second largest airport in the Netherlands, with 4.3 million passengers in 2015 (well behind Schiphol, which serves more than 58 million passengers). The airport is used by both civilian and military traffic. From Eindhoven Airport there are more than 70 destinations available with a flight connection. These destinations are within 25 countries which make Eindhoven Airport an airport with a direct link to many countries within Europe and also Egypt, Morocco and Turkey. For journeys destined further away from the Netherlands a departure from Eindhoven Airport is not yet available. However, being a growing airport Eindhoven Airport can provide more destinations in the near future. With all the holiday destinations close to the Netherlands within touching distance due to the airport, Eindhoven Airport can provide to all your holiday needs. Tulip Inn Eindhoven Airport is a modern and elegant 3-star hotel with a marvellous location. This hotel is located in the terminal of Eindhoven Airport making it a convenient resting place between flights or before early flights. With over 120 rooms, a modern fitness area, a bar, a restaurant and planned events, Tulip Inn Eindhoven Airport is an absolute recommendation. For other hotels, located further away from Eindhoven Airport but still in Eindhoven, please head to our Hotels section. A link to the site of Rentalcars, completely in English, is self-explanatory and can be a helpful medium to hire a car at Eindhoven Airport. Eindhoven Airport facilitates different opportunities for parking your car. Directly in front of the airport is P1. The first 15 minutes of parking in P1 are free of charge as this parking lot is meant for the kiss and ride part of the airport. For a longer parking spot, Eindhoven Airport has P3, P4 and P5. P3, P4 and P5 are all on walking distance from the airport (300-400m) and offer plenty of room for parking purposes. There is no possibility yet to travel to Eindhoven Airport by train, in the not so distant future it will be possible to travel towards the airport by means of train. Busses 400 and 401 have a route from Eindhoven Station to Eindhoven Airport and vice versa where busses regularly depart. For more information please head to our Public Transport section. 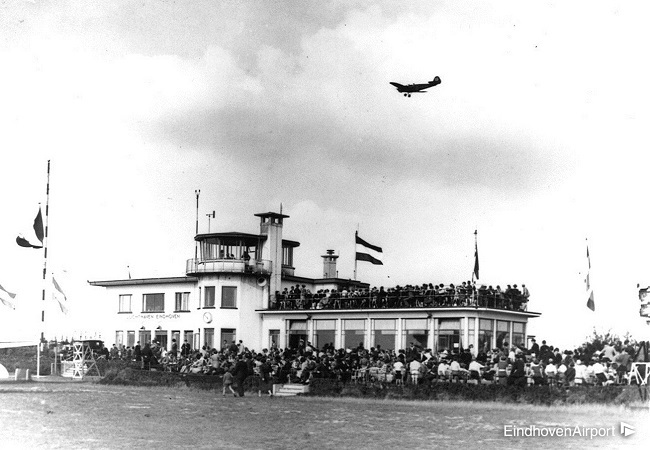 The airport was founded in 1932 as a grass strip under the name Vliegveld Welschap (Welschap Airfield). In 1939 the airfield was acquired for use by the Air Force, as concerns over a military conflict with Germany increased. The airfield was captured quickly by German forces during theBattle of the Netherlands and re-used by them under the name Fliegerhorst Eindhoven. The airfield was expanded and improved by the Germans, with three paved runways and numerous hangars and support buildings being constructed. The airfield was captured by American paratroopers duringOperation Market Garden. Damage to the airfield was repaired and the airfield was re-used as an Advanced Landing Ground by both US and British forces under the designation B-78. The airfield was returned to the Royal Netherlands Air Force in 1952. It was home to Republic F-84G Thunderjet,Republic F-84F Thunderstreak, Northrop NF-5A/B and finally the General Dynamics F-16A/B Fighting Falcon. 316 Squadron flew the F-16 and was inactivated in April 1994. In 1984 a terminal building for civilian air traffic was constructed, based on a design of Leo de Bever. After the end of the Cold War, Eindhoven was transformed into a military transport base. Initially it was home to F27-300M Troopship aircraft. Over the years to come, Fokker 50, Fokker 60, McDonnell Douglas KC-10, Lockheed C-130 Hercules and Gulfstream IV aircraft were stationed at the air base. The Fokker aircraft have been retired. On the civilian side, the airport has continued to grow and is now the second largest airport in the Netherlands. 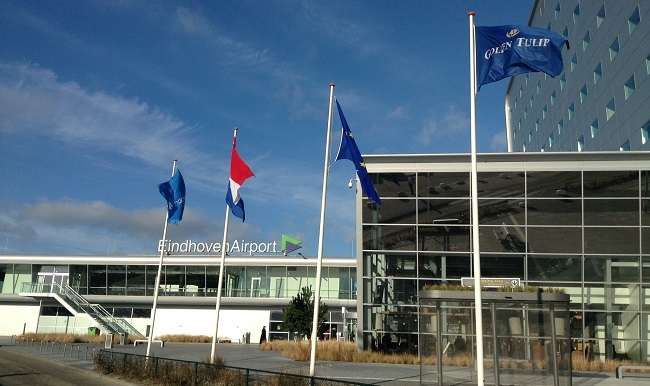 To accommodate this, in early 2012 work to further expand Eindhoven airport was started. Now, there is a 120-room Tulip Inn Hotel. From 1 July 2007, Eindhoven, is the location of the Movement Coordination Centre Europe (MCCE), a merger of the former European Airlift Centre (EAC), established by the European Air Group, and the Sealift Coordination Centre (SCC). MCCE is a non NATO/non European military organization. MCCE is an organization open to all Governments whose membership is accepted by all the others participant nations, regulated by a specific legal technical agreement. The Mission of the MCCE is to coordinate the use of Air Transport, Surface Transport (sea and land) and Air-to-Air Refuelling (AAR) capabilities between participating Nations and thereby improve the overall efficiency of the use of owned or leased assets of the national military organisations. The Centre’s main focus will be on strategic movements, but not excluding operational and tactical movements. From September 2010 Eindhoven Airport is also hosting the European Air Transport Command, composed of six European nations who share aerial military assets in a single operative command. Eindhoven Airport is located just off the A2 motorway which offers direct connections to the west and south of the country, including the cities ofAmsterdam, Utrecht and Maastricht. The airport is also served by two of Eindhoven’s bus routes. Line 400 is a shuttle bus service line that connects the airport to its main railway station. The service frequency ranges from twice an hour in late evenings and early mornings to four times an hour during the day. Line 401 is a bus rapid transit line (see: Phileas) that connects the airport to Eindhoven’s city centre and its main railway station. The service frequency ranges from twice an hour late in the evenings to eight times an hour during the day. Line 145 connects Best railway station and the town of Best with Eindhoven Airport. Line 103 connects Eindhoven railway station via the northern district ofWoensel with the airport, and connects the airport with the town of Veldhoven.